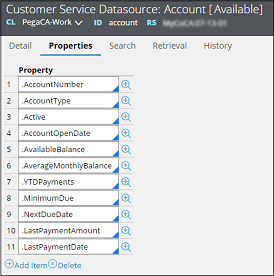 Pega Customer Service allows you to define customer reference properties that can be used to create or edit dialogs in the service requests. This allows the dynamic display of dialogs that are personalized for each customer interaction using the properties defined in rules. You can insert the properties into a dialog script using Customer Service Datasource rules. You can insert the properties into a dialog script using Configuration Tools provided in the service cases. 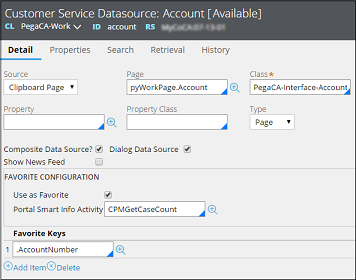 Click Data > Customer Service Datasource to display a list of instances. Select an instance and save it to your ruleset. Label - The name and description of customer service data source record configuration. Enter the valid information in the Page and Class fields. Ensure that the values specified for page and class reflects the desired data object where properties are defined. For example, Account, Contact, and Business Unit. Select the Dialog Data Source check box. Enter the valid properties that can be used in the dialog scripts. Users can select the properties when using the Configuration Tools wizard to create or modify the dialog scripts.